Great review, especially the driving impressions part which was the only important thing to know really. But going through that and the "smile that it puts on your face" i can't understand the ranking that the Mods have given in terms of the engines. The power and torque combination of the EcoBoost feels very punchy and i may be in the minority here but once you get the feel of a turbo petrol, NA cars just feel like missing that zing , that push back in the seat feeling which just doesn't come in NA. The diesel feels fun to drive for the same reason. The Ecoboost has good mid range punch and thanks to the 6th gear, highway cruising is much more relaxed. However the Dragon 1.5L is a better all rounder. It has more usable power for daily use. The Ecoboost S is the one to get if your driving is mainly on highways and you won't be using it much in the city. However if you intend to use it for the urban commute the Dragon is the pick and you can even get an AT. The Ecoboost with the new ratios is better than before in urban traffic but still not better than the Dragon. So you can say the appeal is better than before but they have done such a good job with the Dragon. Both the 1.0L and 1.5L Dragon are 3 cylinder engines. The 1.0L has a lot of additional bits like turbo+intercooler which is probably why the 1.0L is heavier. The 1.5L will just have a slightly bigger block and larger pistons. So it actually makes sense why the Ecoboost 3 cylinder is heavier than the 1.5L Dragon 3 cylinder. Yes the signature has a different audio setup. The Titanium+ and Sports get Ford SYNC3 system with the center speaker whereas the Titanium and Signature get a 9inch touchscreen system that is different. It has(read capability) by far, the best soundstage on any indian car. I wonder what is the sound setup on this S version. Looking forward to test drive it, folks at ford are friends. Read up more. I think its more to do with aluminium construction of the block in case of the 1.5 while its cast iron in case of the 1.0 EcoBoost. The 1.5's output is very impressive especially because its port injected (as opposed to direct injected 1.0) and no turbocharging. Ah yes, I missed that. Aluminum vs cast iron will be a significant increase in weight. So it's probably a combinatin of turbo+intercooler+cast iron block. Nice review, many thanks for this. I had initially confused the Signature and S editions as being the same thing, so its good to see that the S edition is a meaningfully different variant. Colour me weird, but to my eyes the biggest draw of the S is the instrument cluster that looks much better than the one on the Titanium+ and lower models. I cannot fathom what possessed Ford to put in such a peculiar looking instrument cluster on the lower variants (a design that is only acceptable in a base variant targeted at fleet use). Beautiful alloys, but at 17" they're a spine killer on many Indian roads. I also wish that the orange-keyed inserts were coloured differently - it works for certain colours, but might be a contrast for other colours (e.g. blue). Or Ford could have just gone with a dark metallic finish, similar to the alloys & front grille. In terms of the drivetrain, the absence of an automatic in the S range is a shame. The Dragon+TC combo should have been offered here as well. 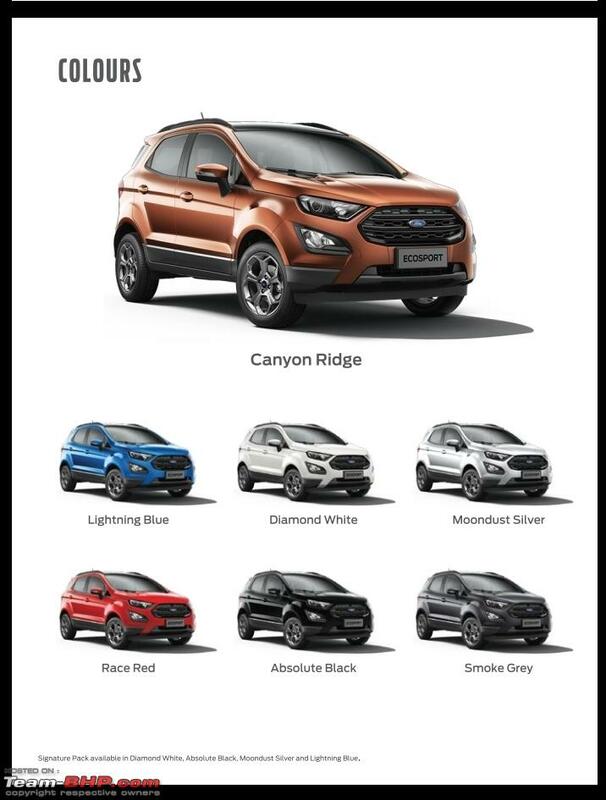 Right now, on the petrol side, Ford continues its usual EcoSport tradition of not having one true top-end model - you can either get an automatic limited to Titanium+, or go for the S variant but get the manual EcoBoost. Last edited by arunphilip : 3rd September 2018 at 14:34. Great review there! After all these years, its still a very smart looking car. It looks like Ford has taken the Orange is the new black thing pretty seriously. Can't see any reason for keeping those orange inserts; matching color inserts to the exterior would have been ideal. What makes it worse is Ford's poorly thought out decision of giving the S variant 17" alloy wheels (Titanium+ luckily goes back to 16s)! My Ecosport Titanium+ which we bought last month came with 17-inch wheels! Have they changed to 16' wheels within the last 1-2 month(s)? Yup. After launching the S variant the Titanium + is downgraded to 16 (its more like an upgrade actually!). You also no longer get TPMS. 1) Titanium : With all the necessary features. 2) Signature : Based out of Titanium with meatier looks, more safety features, sunroof and 17' alloys. 3) Titanium +: Comes with 6 airbags, other host of safety features, brilliant ICE (8' one). 4) S : Based out of Titanium + with sportier looks, sunroof, 17' alloys, TPMS, HID headlights, bigger and better MID etc. For the 1.0 variant, 6-speed GB also available. If I were in the market for a compact SUV I will go with the Ecoboost S version. It has everything I want and some more. Yes the 1.0 wouldn't be as easy in the city drives (as the 1.5 Dragon) but out on the twisty roads it would be fun with punchier mid range and out on the highway will give a better cruise-ability, thanks to the 6th cog. The 1.5 diesel still seems to be the most practical variant but the 1.0 should be more fun if the driver loves to revv the engine. After launching the S variant the Titanium + is downgraded to 16 (its more like an upgrade actually!). You also no longer get TPMS. Do Ford really believe this goes down well with customers - the constant fiddling around with what is included/excluded from a variant? It started in mid-2013 with the original EcoSport, and there seems to be no signs of letting up on it. I might have accepted the switch from 17" to 16" alloys as a reaction to customer feedback, but the removal of TPMS is just to make it exclusive to the S variant. Agreed, Ford aren't the only manufacturer doing this (Hyundai comes to mind), but as Ford are a one-hit wonder, you'd think they'd tread more cautiously with their star product. Last edited by arunphilip : 3rd September 2018 at 18:50. Only wish the colour schemes were the opposite though. Ford S just absolutely needed that blue colour they gave to Signature edition - thats just tradition Ford. 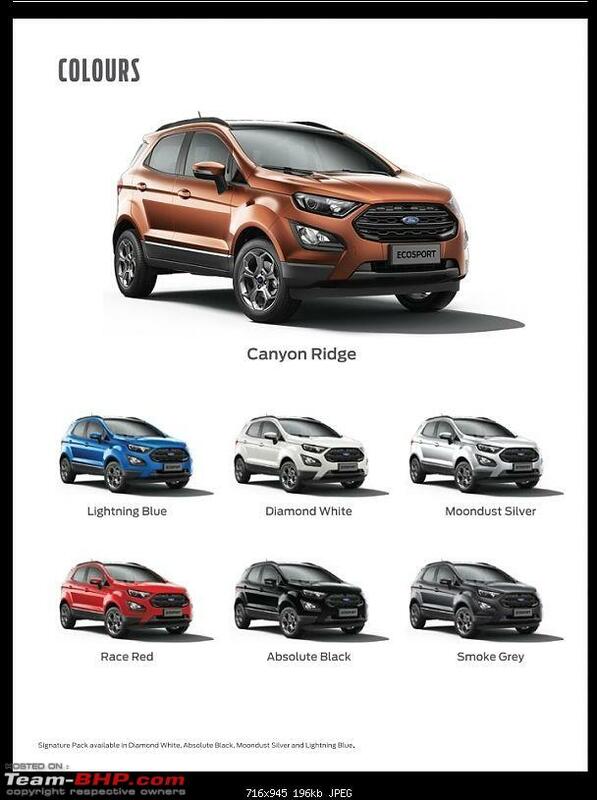 The EcoSport S is also available in the Lightning Blue colour. It's the Signature that only comes in White, Black, Silver and Blue colours only. It looks absolutely wicked in that Ford Lightning Blue paint-shade. Last edited by aah78 : 5th September 2018 at 01:23. Reason: Picture inserted in-line. Removed blurred image. The EcoSport S is also available in the Lightning Blue colour. Would the interior inserts be orange or blue, for this particular combination - S with lightning blue shade? Last edited by CrAzY dRiVeR : 3rd September 2018 at 21:28. Would the interior inserts be orange or blue, for this particular combination - S with l lightning blue shade? Well to be specific, they first removed the TPMS, and then downgraded (read: upgraded) the wheels to 16 inches sometime later. Cause I have 17' wheels but no TPMS I would have preferred the opposite actually. On a side note, within 2000 km of ownership, the 17' rubber already got destroyed in a nasty Mumbai pothole. Even the rim was scratched. Tyre insurance came to the rescue. It's highly recommend to get tyre insurance for these low profile tyres. 5 star review as usual!! Had very similar experience about the drivability of this new engine gearbox combo, and for my 50/50 city/highway usage, city drives took precedence and I went ahead with the Dragon AT. For me, the tone and application of (too much) orange interiors became one of major deciding factors to not go with the S model. Personally, I would love if my car looks sporty from outside, but plush/premium from inside. May be Ford can come up with a list of features based on people's feedback and create an Options(O) pack (similar to Jeep) for customers who would like best of everything and don't mind paying extra. Sunroofs have become a great crowd pullers and so are the Automatic variants. There's a reason Creta is offering Sunroof in AT variant (which misses out on 6 airbags, ECS, Hill Assist etc) in addition to their top end -SX(O). All times are GMT +5.5. The time now is 13:59.